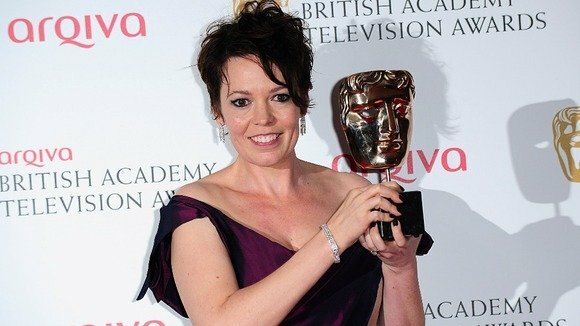 Olivia Colman was the big winner at BAFTA Television Awards 2013, taking the prizes for best supporting actress for Accused and best female in a comedy programme for Twenty Twelve. BBC Olympic satire Twenty Twelve also won best sitcom at the TV BAFTA Awards. BBC One’s Last Tango in Halifax took best drama series and Channel 4’s London 2012 Paralympic Games won best sport and live event. The Paralympics beat the BBC’s coverage of the Olympic opening ceremony, Super Saturday and the men’s Wimbledon final. Ade Adepitan, who co-presented the award-winning Paralympic coverage with Clare Balding, thanked Channel 4 for “allowing us to show the Paralympics warts and all” and for “allowing us to be ourselves”, referring to his fellow Paralympic athletes. Ben Whishaw won best actor for Richard II (The Hollow Crown) on BBC Two, and looked stunned. Simon Russell Beale won best supporting actor for Henry IV Part 2 (The Hollow Crown), but was unable to attend the ceremony. Clare Balding, who won a BAFTA Special Award, said she was “aware this would not have happened if it weren’t for the magic of last summer”, referring to the 2012 Games, when she presented for both the BBC’s Olympic and Channel 4’s Paralympic coverage. “I’m so grateful to the BBC and Channel 4 for putting me at the heart of those events,” she said, before tearfully thanking her parents and her partner. BBC Two’s The Shame of the Catholic Church (This World) won the best current affairs BAFTA, beating the BBC One’s Britain’s Hidden Housing Crisis (Panorama Special), ITV’s The Other Side of Jimmy Savile (Exposure) and Al Jazeera Investigates’ What Killed Arafat?. Other winners included Murder, from The Killing director Birger Larsen, which took the prize for best single drama, beating The Girl. Game of Thrones took the prize for audience award. BBC Two’s 7/7 One Day in London won for best single documentary and ITV’s Hillsborough – The Truth at Last (Granada Reports) took the BAFTA for best news coverage. Room at the Top won best mini-series, beating Accused, Mrs. Biggs and Parade’s End and The Great British Bake Off won best features. Alfred Hitchcock drama The Girl had been up for four BAFTAs but left empty-handed. Graham Norton hosted the ceremony at London’s Royal Festival Hall, where he won best entertainment performance for The Graham Norton show. He thanked the BBC, the guests and his team, who he joked did not enjoy being up on stage. Steve Coogan won best male performance in a comedy programme for Sky Atlantic’s Welcome to the Places of My Life. He was not there to collect his award but a message from him read: “Thanks very much, I’ve got five now… “. BBC Three’s The Revolution Will Be Televised was named the best comedy programme. Channel 4’s Alan Carr won best entertainment performance for Alan Carr: Chatty Man while the channel’s All in the Best Possible Taste with Grayson Perry won best specialist factual show. BBC One’s EastEnders took best soap and best reality and constructed factual show went to Channel 4’s Made in Chelsea. Girls won best international show. Doctor Who’s 50th anniversary was celebrated during the ceremony with a montage of clips from the show and a sketch with the current Doctor and his assistant, played by Matt Smith and Jenna-Louise Coleman.